Music librarian Nancy Zavac teaches Music Bibliography (MCY 728) at the Weeks Music Library. In this series highlighting the lesser-known facets of University of Miami faculty and staff, get to know Weeks Music Librarian Nancy Zavac and how she spends her time away from the U.
Nancy Zavac, head of the Marta and Austin Weeks Music Library, has served as a resource to the students and faculty of the UM Frost School of Music for the last four decades. Zavac began working at the library while obtaining a Masters in Musicology at UM while simultaneously completing a library science degree remotely—pre-internet—from Florida State University. She worked first as a library assistant and then as a music cataloger, learning much from her time working with music librarian Elsie Fardig. 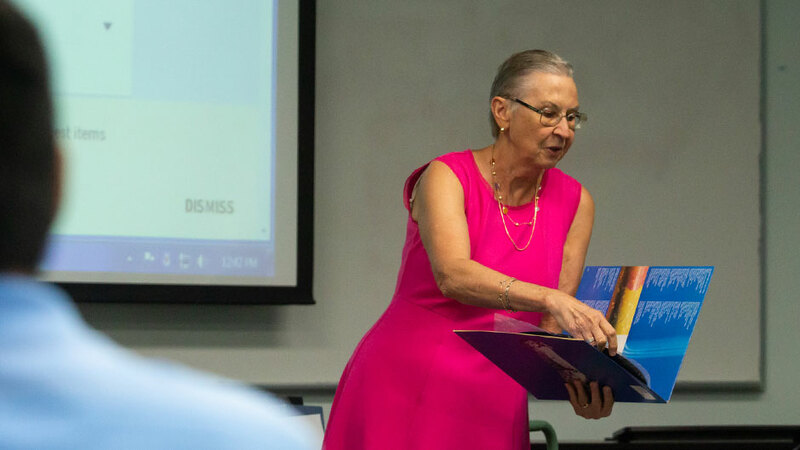 Zavac says working with students is her favorite part of the job and has spent some of her time at UM in the classroom introducing students to music sources, teaching them how to evaluate and cite these sources in research papers and how to write a research proposal. But her background in music began in grade school in the small Western Massachusetts town of Adams—named after Samuel Adams—when she picked up her first instrument, the accordion. These days you can find Zavac attending concerts, musicals, and operas with her husband, Jeff Zavac, who is an accomplished jazz musician, or visiting family in Poland, her father’s home country. She believes music “truly is the universal language” and enjoys performing with her husband. Read our Q and A with Zavac to learn more. My first instrument was the accordion. I learned to play because I wanted to take after my father, who was self-taught. I began taking private lessons at the age of eight and continued through high school. After then, I chose music education as my major at Carlow College in Pittsburgh, PA and studied piano and organ. How did you and your husband Jeff begin playing music and what’s it like performing together? I met my husband Jeff in 1977. We were both graduate students at the University of Miami and volunteers for the music groups at St. Augustine Church—I played the organ and Jeff played flute. Jeff is an accomplished jazz musician who plays saxophone, flute, clarinet, and piano. He lost his sight at birth due to complications but says it’s been his greatest blessing because he’s had to work harder to achieve his goals. In addition to playing at clubs and restaurants he has performed for senior citizen at assisted living facilities, such as the Miami Jewish Home and Hospital for the Aged, and I’ve joined him at times with my accordion. It’s a great joy to play music together! The accordion and the saxophone blend well together. I grew up playing polkas and you can’t be sad listening to polkas! Our next performance is this Sunday at an Oktoberfest dinner from 5 to 7 p.m. at Concordia Lutheran Church. At work or among your circle of friends, what are you known for? I am a breast cancer survivor. I have known close friends and family members who have had cancer and always worried about getting cancer. I went through surgery, chemo, and radiation from Oct. 2011 to May 2012. Through this experience I met a wonderful group of survivors and caregivers and I still participate in the support group known as Your Bosom Buddies. What’s the last book you’ve read or film you’ve seen? Jeff and I recently saw “Pick of the Litter” at the Cosford Cinema. It was a wonderful story about how Guide Dogs for the Blind, a guide dog school, prepares their puppies for this important role. As for books, I tend to read fiction. One book that impressed me recently is “The Other Einstein,” by Marie Benedict. Editor’s note: Know anyone with an interesting hobby or passion project? Share your story ideas with us at LifeatTheU@miami.edu.